A verve for life rollicks beneath the poems in Robert Walton’s first collection for Seren. Pinned to the page, they jostle in place – I have the impression of them being eager to flurry off downstream, seeking new sights and new adventures. Perhaps it’s the tumult of years inside them that’s caused this. Walton’s debut came out in 1978, and while the intervening years included plenty of publications of individual poems and even a chapbook, this, emerging 39 years later, is the second full book from the accomplished poet. Walton refers to the expanse of time as an effort of procrastination, but I suspect his delight in actually living, rather than pondering, is part of the reason for the lengthy gap. I’m pretty sure there’s a double-meaning on the word lie – a child’s treachery perhaps built on the love of and for his father. There’s a subtle shame behind the subterfuge, but also a faint self-mockery, not for failing to gain a fanaticism for football, for so yearning to do so. Walton is a man riddled with self-awareness, in both senses of the word, and blessed with an ability to take himself admirably lightly. Just as he sees the glory in everyday occurrences, he recognises the qualities in the paths he’s chosen, and of those he’s turned from. There’s a fondness for those distant paths, however, which shines up brief flashes of appreciation into something powerful enough to stop you in your tracks. Under Robert’s gaze, the world is full of wonder. This never more apparent than in his beautifully weighted poem Greenland, in which the scope widens then narrows with breathtaking skill as we take in a snowbound steppe that was once pulsed with life. Robert gather us up in his wings and swoop inwards to deposit us into a moment of dizzying intimacy, beside the white pillow where his mother’s head rests and he is willing her eyes to open. 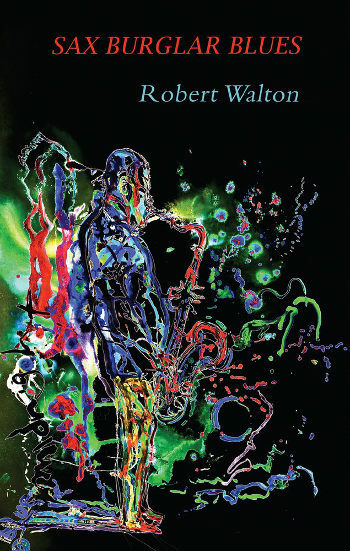 Sax Burglar Blues by Robert Walton is published by Seren. Buy your copy from Amazon. Read my review of A Watchful Astronomy by Paul Deaton. Read my review of In Her Shambles by Elizabeth Parker. What are you reading? I’d love to know. I’m always happy to receive reviews of books, art, theatre and film. To submit or suggest a book review, please send an email to Judy(at)socketcreative.com.